Roy Keane has ended weeks of speculation and completed his move to Celtic by signing an 18-month deal. The 34-year-old Irishman, who ended his Manchester United career in November, had interested several Premiership clubs and Spanish giants Real Madrid. 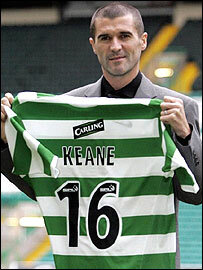 But, as he was unveiled at Celtic Park, Keane said: "I gave other clubs a chance and was impressed with them all. "But it's a great move for me. I feel that this is where I belong and I'm here to work hard and win games." Keane had appeared close to joining Real only days ago, while Bolton, Everton, West Brom and West Ham were among other clubs to express their interest. And he revealed that he had still been mulling over his decision up until his arrival in Glasgow for talks on Wednesday. "I've been in the Premiership for a long time and feel I have proved myself there and needed a different environment, different teams, different grounds," said Keane, who had in 1999 said that he would like to end his career at Celtic Park. "Every boy in Ireland has an interest in Celtic, although my English team at the time was Spurs for some reason. "I've been up to Celtic to watch a few games and always enjoyed my time here." His move to Scotland comes after nearly 13 years under Sir Alex Ferguson at Old Trafford and a well-documented falling-out with the club. Keane was reported to have been critical of a number of his United team-mates in a MUTV programme that was pulled from the schedules because of its content. But, stressing that he had been free of injury for a month, he said that he did not expect to walk straight into the Celtic team and rejected suggestions that he could be a disruptive influence in the dressing-room. "This is not a financial move for me and I'm not coming here for an ego trip or to unwind," said Keane, whose deal is believed to be worth £40,000 a week, about half what he was on at Old Trafford. "I had an important role in front of the back four at United, but I might be given more licence to play here. "I push myself hard in training and try to push others hard - and people seemed happy with that until a few weeks ago." Celtic chief executive Peter Lawwell insists the whole club are behind the signing and rejected suggestions that Celtic majority shareholder Dermot Desmond had personally bankrolled the signing. "We are absolutely delighted - the board, the management and the players," he said. "Dermot Desmond has been a fantastic supporter of this transaction. "But, in terms of his support, that is where it started and ended. There is no financial contribution Dermot will make towards this deal." Manager Gordon Strachan added: "He has proved over the last 15 years that he is a competitor. "You can't get enough competitors in your squad and this was too good a chance to miss." Keane will not be eligible to make his Celtic debut against Hearts at Tynecastle on New Year's Day as Scottish Premier League rules do not allow for players to be both registered and play on the first day of the new transfer window. He will instead be aiming to face Clyde at Broadwood Stadium in the Scottish Cup third round the following weekend. Is Keane the perfect present?